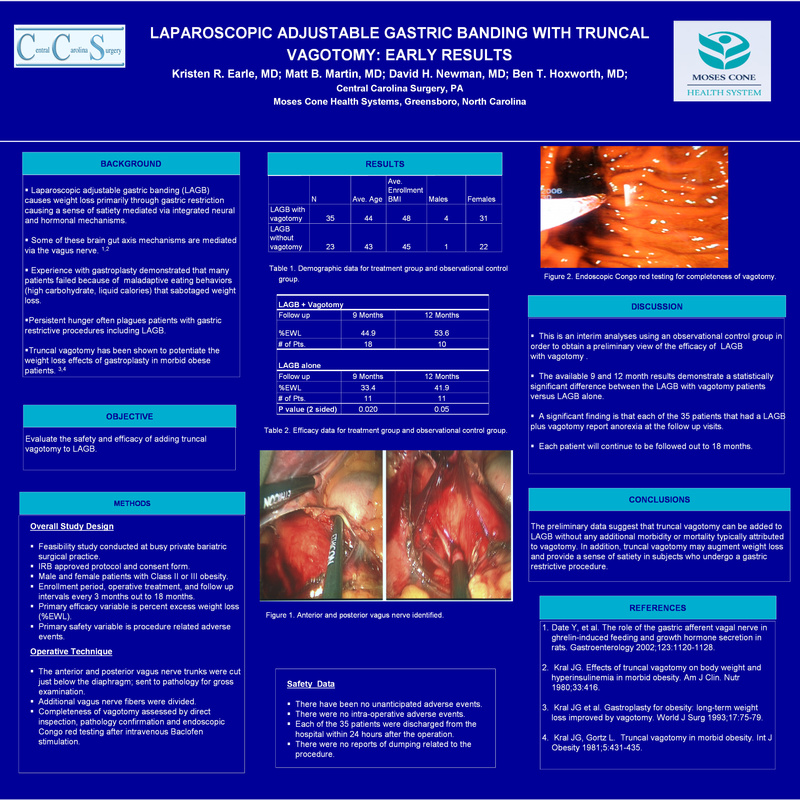 Objective: Laparoscopic adjustable gastric banding (LAGB) causes weight loss primarily through a mechanical restrictive mechanism. The vagus nerve provides connections between the brain and the gut through afferent and hormonal signals that regulate fullness and satiation. Published studies demonstrate clinically significant weight loss in subjects undergoing open surgical truncal vagotomy for ulcer disease and morbid obesity. The primary objectives of this study were to evaluate the safety and efficacy of adding truncal vagotomy to LAGB. Methods: This is an 18 month, open-label feasibility study that was conducted at Carolina Surgery Center, a private bariatric surgery practice. Since May 2006, 35 subjects with Class II and III obesity underwent LAGB with truncal vagotomy. The anterior and posterior nerves were cut just below the diaphragm and sent to pathology. The primary safety variable is the number of procedure-related adverse events. The primary efficacy variable is the percent excess weight loss (%EWL). Follow up intervals are every 3 months. Completeness of vagotomy was assessed by direct inspection, pathology confirmation and endoscopic Congo red testing after intravenous Baclofen stimulation. Results: 35 Subjects (31 women) with mean enrollment BMI 48 kg/m2 (range: 37-70) and mean age 44 years (range: 24-62) were operated on. There were no intra-operative or unanticipated adverse events. All subjects were discharged within 24 hours. There was one case of incomplete vagotomy confirmed via pathology. The available 6 month (N=17) and 9 month (N=12) efficacy data demonstrate 40% EWL (range: 13-57) and 47% EWL (range: 22-70) respectively with each subject reporting anorexia. Conclusions: The preliminary data suggest that truncal vagotomy can be added to LABG without any additional morbidity or mortality typically attributed to vagotomy. In addition, truncal vagotomy may augment weight loss and provide a sense of satiety in subjects who undergo a gastric restrictive procedure.